The fascination for this subject is based on the idea of a ‘measurable means’ of attuning a person to their current emotional state - doing so though a ‘snap-shot’ of sensory stimulation embodied in an artefact. The project is concerned with extending our ability to comprehend and empathise with the relatively abstract elements that science allows us to understand as vital building blocks of our being and experience. I have focused to explore the construction of sensory dimension through the combination of sound, light and smell in collaboration with science and art. Science has contributed to our contemporary experience and perception of reality in a number of influential ways including the way that we receive our knowledge through mediated images. The obvious approach would be through an Art object ‘experience’ that extends the spectrum of what is visible through the introduction of a wider spectrum of sensory dimension. The intention for this artefact is to firstly research how science can give means to develop an effective artefact, which would allow the development of a methodology for visualizing the acoustic of smell. How full is our perception without smell? Is smell really subjective? Can smell be measured on the kind of linear scale that scientists use to measure the wavelength of light or the frequency of sounds? The goal is to design an object, a system, a space, which can alter our state of awareness so we do not perceive our main senses separately, but as one whole. What is the possibility of understanding smell through light and sound in order to attune humans’ senses? The answers constructed are intended only to confirm the potential of extending our awareness of the abstract by the introduction of sensory dimension. 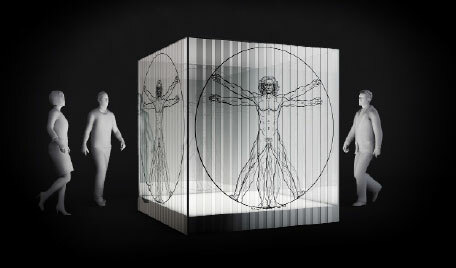 After research was decided to provide this solution through designing a unique artefact in the form of an object, method or pattern to enable respondents to experience the dimensionality of scientific theory. The goal is to find the symmetry between object and subject as between word and meaning from a sensory point of view.